10 days since my last post. No crafting, no pictures but lots of busy work. My thoughts are spinning with all that needs to be done. Hopefully things will begin to slow down into our new routine. Dale Chihuly's work at a museum we visited about a month ago. Years ago, my mother and I used to have subscriptions to this magazine. Loved it. It's not exactly my style, but I always appreciated the dreamy quality of it. When it arrived in the mailbox each month, I'd put it aside and wait until the more 'mundane' things of the day were complete. I mean, in order to enjoy it fully, you just had to have a cup of warm tea and cookie and a soft & quiet place to curl up in. It was ritual of sorts. So when it went out of business, there was much disappointment. We used to cut pictures from it (gasp!) and make cards before handmade cards were popular. I'd drool over the recipes and even manage to try a few. My husband always teased me that I needed to wear rose-colored glasses when reading it; all the pictures must have been shot with that soft, all's-right-with-the-world filter. Anyway, I'm flattered. I've never been awarded anything in blogland before. 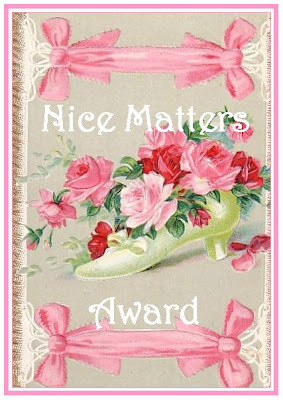 As the 'official' rules go, I now award 7 people whom I think "are just nice people , good blog friends and those that inspire good feelings and inspiration! Those that care about others that are there to lend support or those that are just a positive influence in our blogging world!" I'd like to add to that description by including those rather new blogs (new to me) that I've stumbled upon within the last few months. Great inspiration! This one is sort of an obvious choice for the letter Y, unless of course I owned a Yak (which I don't) or I was a professional Yodeler (which I'm not) or I couldn't bear to live without the color yellow (which I can...well sort of).